Three months ago, my boyfriend went back to Malaysia. When he left, we decided to get engaged this Christmas and married next June. After he left, I became very lonely. I love him very much so I didn’t go out with anyone. When he left I weighed 110 pounds. I got on the scales yesterday and I weighed a big 142 pounds! I have been so lonely without him that I ate on an extra 32 pounds. Now I am absolutely desperate. What can I do. 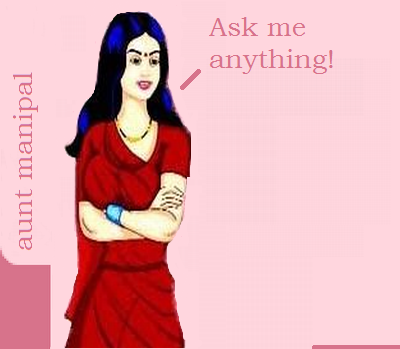 Aunt Manipal? He’s coming to see me in two weeks. You do have a weighty problem. You’d better try taping your mouth shut at mealtime lor the next two weeks. And playing around at the MARENA, Manipal every evening for an hour or two. About two months ago I started dating a real nice chick. I’ve grown very fond of her and vice versa. With her birthday coming this August, I’m really worried about buying her a present. She’s a nice girl, but she has very expensive taste. Unfortunately, I don’t have a wallet to match her taste. What can I get her that she’ll like, but won’t be too expensive? I hope your friend likes you—not your money. Stop worrying, if she’s really fond of you, anything you get her is bound to make her happy! And if that doesn’t happen, do read what we write about love here. Especially the sentence where psychologists say “there are 20 perfect girls for each guy and vice-versa”. I have a problem that, although small, is driving me crazy. My boy friend is the best thing that ever happened to me. However, he has one flaw that really bothers me. He has dandruff! The dandruff is bad enough, but to make matters worse, his favorite color is black. That’s right, Aunt Manipal, black shirt and white dandruff. Have you tried sending him a white shirt in a plain brown wrapper? And at the same time do read what we write on “How to Makeover your man“.